"It all starts with Chaos Effect. Sales are less than expected, and the Night Hunter series is cancelled because of this. The Jurassic Park series becomes "somewhat of a thorn in Hasbro's eye". In 2000, Star Wars Episode One toys were overproduced. Sales were low and Hasbro had to downsize. The victim was the Kenner department in Cincinatti. 100 people were transferred, 400 were fired. Amongst these 400 was the Jurassic Park design team (not just JP, they also designed Batman amongst other toy lines) , who had just started the very early concepts for Jurassic Park///. Now that there wasn't a design team for Jurassic Park anymore, Hasbro assigned it to their Star Wars people, who scaled the humans to be in size with Star Wars figures, and made the style of the toys similar to the ones from Episode II. This is, in a nutshell, why the scale and style is so different from 2001 onwards. The employee that I've had contact with is indeed one of the fired people, and he helped me on detailing the story and pointed out few mistakes on my account, but my research results were pretty much correct when I put them together." So we can all blame it on George Lucas eh? Regardless of how it all came down, it does provide a nice behind the scenes look at just what was going on during that time. We hope to bring you more of these articles in the future and create a somewhat comprehensive look at the history of the Jurassic Park line. 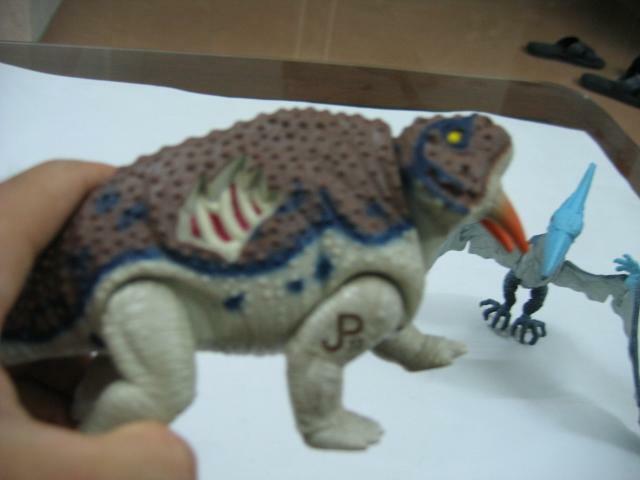 If you remember way back to February of 2003 we had our first ebay sighting of the unreleased JPS2 Scutosaurus & Ornithosuchus. Well it appears that Scutosaurus at least has popped up online again but this time on the Chinese site Taobao (think ebay). It's very interesting to see these rare items showing up from time to time on ebay and various other sites such as this. It really makes you wonder just what other JP gems are out there waiting to be discovered. A big thanks to forum member 'Piltdown Chickenraptors' for the heads up. "I just got off the phone with hasbro and to my suprise I found out that they are no longer holding the Jurassic park license but it has instead been sold to a different company for production of a "yet to be named" new JP line. That will possibly be realesed by christmas. The JP dinosaurs series 3 line was in fact the last line that we will ever see from hasbro so says "Devon, The guy I spoke with." He said there is bigger and better things in store for JP. When I asked about JP4 toys being produced by hasbro, He said that all the JP4 information is "Non-Disclosed for the time being." Before I had the chance to hang up He asked if I was a JP fan of sorts and of coarse I replied with a Exuberient YES! He said I will be satisfied before the years end." At this point we've heard so many varying reports that it's hard to keep things straight anymore so as always, please take this with a grain of salt until we can get further verification. However, if this turns out to be true it looks like an exciting time for JP collectors in the next 6 months or so.